We hope you got some rest over the holidays, because you’re going to need it. As is now the standard, this year brings with it a plethora of science fiction/ fantasy/superhero/monster/comic book/spin-off/remake/etc. TV series—and were her with a handy guide to help you keep track of it all. Choose what to watch wisely... because there’s a lot of it. This long-delayed take on The Wizard of Oz finally premieres this week and, if nothing else, it looks visually interesting. On the other hand, it also sounds like another attempt to do “gritty take on an old classic” that is wearing very thin these days. But, hey, Vincent D’Onofrio’s got quite the beard. After a film adaptation that left something to be desired, Netflix is doing its own attempt at making a dark comedy out of the lives of Violet (Malina Weissman), Klaus (Louis Hynes), and Sunny Baudelaire (Presley Smith) after their parents’ deaths. The previews definitely show a series in touch with the gothic sensibilities of the books, and with Neil Patrick Harris as the villainous Count Olaf, Patrick Warburton’s distinctive voice narrating, and veteran comedy actors like Joan Cusack, Aasif Mandvi, and Catherine O’Hara, this show really feels like it could work. As a new school year begins, the town of Riverdale is reeling from the recent, tragic death of high school golden boy Jason Blossom - and nothing feels the same... Archie Andrews (KJ Apa) is still the all-American teen, but the summer’s events made him realize that he wants to pursue a career in music - not follow in his dad’s footsteps - despite the sudden end of his forbidden relationship with Riverdale’s young music teacher, Ms. Grundy (Sarah Habel). Which means Archie doesn’t have anyone who will mentor him - certainly not singer Josie McCoy (Ashleigh Murray), who is only focused on her band, the soon-to-be-world-famous Pussycats. It’s all weighing heavily on Archie’s mind - as is his fractured friendship with budding writer and fellow classmate Jughead Jones (Cole Sprouse). Meanwhile, girl-next-door Betty Cooper (Lili Reinhart) is anxious to see her crush Archie after being away all summer, but she’s not quite ready to reveal her true feelings to him. And Betty’s nerves - which are hardly soothed by her overbearing mother Alice (Madchen Amick) aren’t the only thing holding her back. A full-on sitcom set in the DC universe, Powerless stars Vanessa Hudgens as a new R&D head at Wayne Security, a subsidiary to Wayne Enterprises (yes, that Wayne) that specialises in providing gadgetry to keep civilians safe in the events of superhero-related calamity. In addition to dealing with that, she also has the usual obstructionist boss and strange co-workers. It’s a workplace comedy with a superhero twist, and you can expect plenty of DC easter eggs. Legion is the first live-action TV show that is (vaguely) set in the X-Men universe. The show focuses on David Haller (Dan Stevens), a man diagnosed with schizophrenia and sent to mental hospitals. Of course, it’s not just schizophrenia he has, but powerful mutant powers that make him the target of experimentation. Or he’s hallucinating. It’s hard to tell. There are only eight episodes of this show coming this year, so savor every one. Netflix and Marvel’s fourth show follows Danny Rand (Finn Jones) as he returns to New York after being missing for years. “Missing” in this case means that, after a plane crash killed his parents, he was found and trained in martial arts and the ability to call upon the mystic “Iron Fist.” Back in New York, he tries to recover his family company and fight the threats that emerge as he does so. This adaptation of Margaret Atwood’s novel stars Elisabeth Moss as Offred, the protagonist, who lives in a future under a fundamentalist dictatorship where everyone has a place dictated by religion. Offred is a handmaid, a class that has proven fertility and, because of declining birth rates, are assigned to upper-class couples to bear children for barren wives. The book explored Offred’s forms of resistance, history, and the hideous treatment she suffers, so we can assume the show will do the same. Bryan Fuller’s adaptation of Neil Gaiman’s novel, through near-perfect casting and styling, has become a show we are desperate to see more of. It follows Shadow Moon (Ricky Whittle), an ex-con who enters the employ of Mr. Wednesday (Ian McShane) and joins him on a weird journey across the United States. The latest trip to Star Trek universe has been delayed and lost its showrunner, Bryan Fuller; it could be delayed even further. That said, we know it takes place 10 years before the Original Series and will focus on the ship’s XO Rainsford (Sonequa Martin-Green) instead of the captain (Michelle Yeoh). The limited series return of Twin Peaks still doesn’t have an official return date, but it’s still one of the most anticipated shows of the year. We know next to nothing about what the show is about, but we do know that nearly everyone is returning, including Kyle MacLachlan as FBI Agent Dale Cooper. Other than that, it’s all locked up in David Lynch and Mark Frost’s minds. Itching to find out what this show is like without Abbie (Nicole Beharie)? Neither are we. We’re skipping Sleepy Hollow’s fourth, and probably last, season. Colony focuses on the choices of people living under the rule of alien invaders. It’s not a science fiction show based on impressive shots of aliens, but on the choices people in these extreme situations make. At the end of season one, all of the main characters were separated, some in very bad situations. So expect to see season two pick up from there. After the climax of the brilliant first season of Netflix and Dreamwork’s re-imagining of Voltron, the brave pilots of the Voltron lions were left scattered across space, unaware of where they’d wound up. With the evil Zarkon and his empire on the prowl, they have to make their way back together again and presumably form arms, legs, body, and head once more as the legendary Voltron. This show, while very different from the books that inspired it, is fun, interesting, and surprisingly darker than you’d expect from how it was initially marketed. More than that, it put its characters through the ringer in season one and ended with Julia (Stella Maeve) making a deal with the Beast and Quentin the only (Jason Ralph) the only other person left standing. Everyone else was lying on the ground bleeding. If for no other reason than a resolution to that cliffhanger, the season premiere is a must watch. All out war is coming to the world of The 100, as the conflicts between the Grounders and the Sky People find them turning to face a battle for the fate of humanity itself against the sinister A.I. ALIE. Judging by the recent trailer for the season, it seems like things are going to go real bad for everyone, real quick. This show ended with the “protomolecule”—an incredibly dangerous bioweapon—unleashed on Eros and killing tons of people. The crew of the Rocinante escapes, but sees the ship of the people testing the protomolecule leaving as well. Meanwhile, the tensions between Earth, Mars, and the Belt have escalated, as it has revealed that the ship that destroyed the Canterbury and the Donnanger was built on Earth. And while war is certainly being stoked by a third party as a distraction, only so many people actually know that. The Expanse is beyond just a slow-burn set of mysteries now and is a full-blown war and politics thriller. Set just months after the first season saw more and more members of the robotic servant class gain sentience and awareness, season two picks up as more and more synths find themselves becoming closer to humanity… for better or worse. While it now lives in the shadows of HBO’s Westworld, the first season was must-watch TV. The Vampire Diaries spinoff returns for a 13-episode season four, with season three ending with Hayley and her daughter left alone and defeated and the rest of her family unconscious. This show’s premiere will run two hours, which is great because the more iZombie the better. The last season ended with Liv (Rose McIver) being asked to pick a side—zombie or human—in the attempt to turn her home city into a zombie safe zone. Programming note: This show moves back to 9:00 pm starting on April 11. The third and final season of the show heads to Australia as Kevin finds his father pulling him into “a rather unexpected situation”, which is saying something for a show that follows the people left behind in a rapture-style event. The Doctor is back! 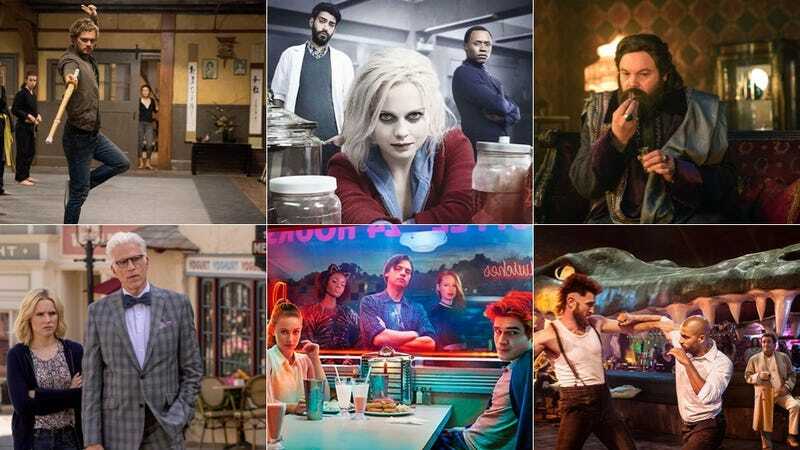 We don’t know much about the 10th season, other than it’s Steven Moffat’s last as showrunner—and that we’ll be introduced to Pearl Mackie as the new companion, cafeteria-staffer turned universe-traveller Bill. Instead of its usual April premiere date, Game of Thrones season seven will be delayed a bit, coming in the summer instead. Characteristically, we don’t know much. But we do know that Cersei’s in charge in King’s Landing and that’s where Daenerys and her army is headed. In order to see if she can stay in the titular Good Place, Eleanor’s case is being taken to Sean, an eternal and grumpy judge, with Good Place steward Michael and the Bad Place’s chief douchebag Trevor, presumably representing her good and bad sides, pleading their cases for ownership of her afterlife. With Ghost Rider gone for now, the show turns its hand towards an arc focusing on the classic Marvel comics plot device, Life Model Decoys. With sinister android Aida revolting, and even Agent May replicated as an LMD hiding in plain sight, expect lots of robot doubles everywhere. The finale season of The Vampire Diaries continues and with only nine episodes left, things are bound to get interesting. Probably. Everyone’s favorite banana-pants comic book show. When we last left the Gotham gang, Barbara had allied with Nygma to overthrow Oswald Cobblepot, Gordon killed Mario to save Leslie Thompkins, and Selina’s mom helped her, Alfred, and Bruce escape after they killed Talon. Lucifer will continue battling with his mom, presumably. The penultimate season of Adventure Time starts at this time, but the miniseries Adventure Time: Islands will air from January 30 to February 2 and tell the story of Jake, Finn, BMO, and Susan Strong traveling the ocean to solve a mystery of Finn’s past. We actually ended the first half of the season with the big crossover event, but when Supergirl returns, we expect to deal with the escaped Henshaw and the mysterious aliens searching for Mon-El. We last saw Barry dealing with accidentally seeing Savitar kill Iris five months in the future. Jay Garrick told Barry that the future “isn’t fixed,” so we bet Barry’s going to meddle in time in a less disastrous way than last time. Savitar also predicted that one member of Team Flash would fall, one would be a traitor, and one would suffer the classic “fate worse than death.” So nothing but joy and light. Legends of Tomorrow is the Arrowverse’s most-improved show. After spending a lot of season one writing it off, we’re a little in love with how much of this season the show has just embraced the ridiculousness of its premise. It’s a bunch of people wandering around time—have fun with it! This crew now has to find Rip Hunter, who is now a movie director in Los Angeles. This will lead to them crossing paths with George Lucas because why not. Things are going to get a lot worse before they get better for Team Arrow, as Prometheus’ trickery in the midseason finale left Felicity’s new boyfriend dead at Ollie’s hands, the team betrayed by Evelyn, and Laurel Lance seemingly back from the dead (and with a sinister reason for being so). But hey, at least the back half of the season will bring the al Ghul sister Arrow always wanted, Talia, to the CW universe! Guess what is still on and will be on forever? Steven and the Gems are back at the end of the month for another run of episodes that promises some big mysteries about the Homeworld Gems and their plans for Earth, and some revelations about the sinister Diamonds that has fans hysterically theorising what major events could befall the show next. The first half of this season of The Walking Dead was frustrating to say the least, but at least it ended with Rick and the other colonies on the road to fighting Negan and the Saviors. Presumably the mid-season premiere will pick up right where it left off—and there’s still plenty of episodes for the season to redeem itself.